Are you looking for a way to digitize and manage your important paper documents in the office and on the road? 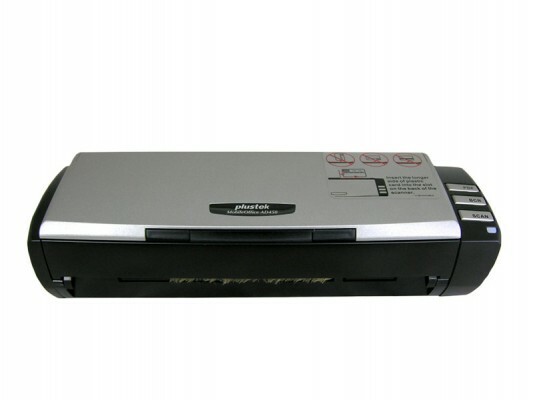 The Plustek MobileOffice AD450 is one of the most flexible document scanners on the market today. The AD450 is very compact and weighs less than 3 lbs and includes a carrying case. This scanner is ideal for field based and remote workers, auditors, real estate agents, in-truck scanning, business travel and any applications where documents need to be scanned away from your home office. Because its flexibility of dual power of USB bus and AC power, the AD450 is ideal for applications like: patient registration, pharmacy prescription scanning, accounting, remote deposit and more. It scans long document up to 432mm (17â€), and embossed plastic card up to 1.2 mm, and now you can turn all of your documents including bank statements, legal documents, insurance papers, medical records, embossed plastic cards, business cards, and any size document into a digital format. Place your documents in the Automatic Document Feeder and with the touch of button, documents can be saved in many popular formats including Searchable PDF, Microsoft Office, JPG and TIF. Documents are automatically sent to many different destinations including: any folder on your network, email, or even a printer. The AD450 is environmentally responsible and easy to use at the same time thanks to its ENERY STAR certification and low power LED illumination technology.